MDEChem DFC or DCP500 is an application-engineered, fuel borne technology that utilizes proprietary technology to produce EPA verified results in the areas of less damaging emissions and less diesel fuel or heavy fuel oil consumption. Fuel additives meant for bunker fuel oils, like MDO, IFO, MFO and HFO fuels cannot just be added to the fuel and blend, those additives need to be injected into the fuel. Bunker fuel oil is generally any type of fuel oil used aboard ships. We can distinguish between two main types: distillate fuels and residual fuels. No. 6 is the most common oil, that’s why “bunker fuel” is often used as a synonym for the No. 6 residual fuel oil which requires heating before the oil can be pumped. No. 5 fuel oil is also called “navy special”. Marine fuels are traditionally classified according to their kinematic viscosity. This is a valid criterion for oil quality as long as the oil is produced by atmospheric distillation only. Today, almost all marine fuels are based on fractions from more advanced refinery processes and the viscosity itself says little about the oil’s quality as fuel. Despite this, marine fuels are still quoted on the international bunker markets with their maximum viscosity set by ISO 8217 as marine engines are designed to use different viscosities of fuel. The density is also an important parameter for fuel oils since marine fuels are purified before use to remove water and dirt. Therefore, the oil must have a density which is sufficiently different from water. Vessels running day tanks, which circulate fuel in a closed system from the engine and return to the day tank, will have the MDEChem DFC injected into the day tank. The QV-60 injection system requires a minimum of a 450 liter/120 gallon day tank. System requirement is a 4-20 mA signal from a flow meter on the system to start and stop the flow of DFC into the tank. Only the fuel entering the day tank from the storage tanks will be treated, the recirculating fuel will NOT be treated to avoid inefficient mixing ratios of DFC. Prior to installation the MDEChem DFC injection system will be calibrated with reference marks for double dose and single dosing. We will need to know the GPM of the supply pump to the day tank for calibration purposes. If your system is using a fuel module we can inject at the suction side of the transfer pump suppling the engine(s). We will need the GPM of that transfer pump also. During the first two weeks of using DFC, a break-in or “greening” period will commence. A dose ratio to treat all the metal surfaces between the day tank or fuel module & the engine(s) is kept at 1 unit DFC to 400 units of HFO 500 cSt (1:400) until 1 unit of DFC to 640 units of MGO (1:640). During this break-in period DFC will speed up the cleaning and surface conversion to all ferrous and non-ferrous metal surfaces to remove carbon build-up. This will enhance the engines performance to begin delivering better fuel efficiency much quicker. After the two weeks of break-in or “greening” period, the maintain modus commences, meaning the dose ratio must change to 1:800 fot HFO500 up to 1:1280 for MGO. These maintain modus ratios remain in place as long as MDEChem DFC is fed to the system on an on-going basis. The stainless steel injection box is 508 mm x 508 mm x 203 mm (20”X20”X8”) and has 4 flanges for mounting. Comes with a seal proof door. All electrical connections inside are enclosed in weather tight boxes to prevent any sparking. 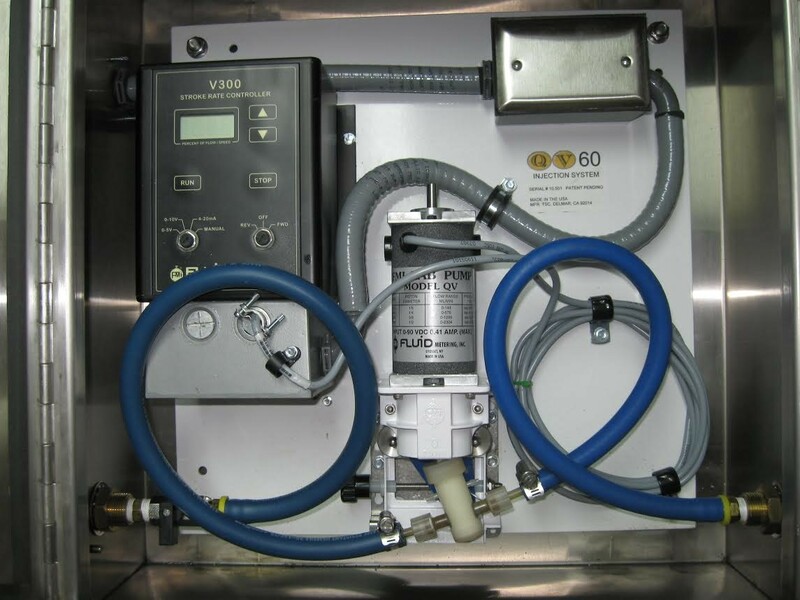 The pump is a 90 VDC which operates from 90 to 1800 rpm depending the calibration needed to match the supply pump flow, and the V-300 controller is 50/60 hz compatible & 100-240 VAC single phase. All box and electrical components have U.S. UL listings. If the vessel has more than one engine room/fuel module or day tank, one box will be necessary for each. If all the engines run from one day tank/fuel module one box will be sufficient. Piping and fittings will be chief engineers choice. Installation of the QV-60 system is a custom-specific job. It is good use to present a SOW (Statement Of Work), along with the FTP (Fuel Treatment Protocol) once a project, pilot or revision is discussed and agreed upon. Our project managers and engineers from NL and the US are at your disposal . References are available on request.